On this day in 1943, inmates at the Sobibor extermination camp in eastern Poland led a revolt, killing 11 SS officers. The inmates were led by Alexander Pechersky, a Soviet Jew who had been captured exactly two years prior during the Battle of Moscow. Pechersky was an unlikely soldier, the son of a Jewish lawyer who studied music and literature and worked at an amateur theater. But like tens of millions of his countrymen, he was thrust into the Second World War following the Axis invasion and conscripted into the Soviet Army, where he quickly served with distinction, saving a wounded commander during an attack. As a POW, Pechersky had already miraculously endured a series of close calls, including a painful seven-month battle with typhus; imprisonment in a cellar called the “the Jewish grave”, where for ten days he sat in complete darkness was fed only a few ounces of wheat every other day; and an attempted escape from a POW camp in 1942, where he was recaptured. Chinese Foreign Minister Wang Yi denied his country was trying to eclipse the U.S. as a world leader, but his speech at the U.N. General Assembly was a stark contrast to Trump’s “America First” message. It came amid rising tensions between the U.S. and China, which Trump accused this week of interfering in the upcoming U.S. midterm elections. China denies the claim. Russia is also facing U.S. accusations of election meddling, which Foreign Minister Sergey Lavrov denounced as “baseless,” but didn’t dwell on. His country has been working to make itself a counterweight to Washington’s global influence, and Lavrov used his speech to lash out at U.S. policies in Iran, Syria and elsewhere and vigorously defended multilateral organizations such as the U.N.
Lavrov and Wang were hardly the only leaders to defend the concept of multilateralism at this week’s U.N. gathering of presidents, prime ministers, monarchs and other leaders. But coming in the wake of Trump’s proclamation that Americans “reject the ideology of globalism,” the Chinese and Russian speeches sounded a note of rebuttal from competing powers. China has been asserting itself on the world stage under President Xi Jinping, though it continually stands by a foreign policy of noninterference in the affairs of other countries. It has long used that policy to rebuke other countries that criticize its record on human rights. At the same time, he said the U.S. should “make timely and positive responses so as to truly meet the DPRK halfway” in their ongoing efforts to reach a deal that would bring an end to the nuclear ambitions of the nation formally called the Democratic People’s Republic of Korea. China says it has been instrumental in reducing tensions between the U.S. and North Korea. Still, “China will not challenge the United States — still less will China take the place of the United States,” Wang said earlier in the day at the Council on Foreign Relations. Lavrov, meanwhile, spotlighted Russia’s role in efforts to end the civil war in Syria, where the government counts Russia as its closest ally. And he said Moscow will do “everything possible” to preserve the multinational 2015 deal deal aimed at curbing Iran’s nuclear program, despite the U.S. decision to withdraw from it. Lavrov called the U.S. move a violation of U.N. resolutions and a threat to stability in the Middle East. Seeking to maintain leverage in discussions on North Korea’s denuclearization efforts, Lavrov met with North Korea’s foreign minister earlier this week on the same day that Ri Yong Ho met with U.S. Secretary of State Mike Pompeo. It is interesting that neither country wants to outright declare itself the next global power, nor frame their respective rise as eclipsing or challenging the U.S. Either this denotes a recognition that America is still a potent power that is not to be openly challenged, or it reflects an acknowledgment that the 21st century is a fragmented place where global power is to diffuse for any single country to be a superpower. Perhaps there is no coherent and cohesive global order to defend, but rather a series of norms that most of the world has accepted for economic or political interest. Some years ago, as an undergrad at FIU, I had chance meeting with one of the greatest heroes I’ve ever known, a man I hadn’t even heard of until that day. It has stayed with me to this day as an enduring reminder of the many unsung and unknown heroes around us who go about their lives without praise, notice, or popular knowledge. Khassan Baiev is a Russian-born doctor, now living in the U.S., who risked his life to indiscriminately help those in need in the midst of a bloody warzone. As a sickly and frail Chechen youth growing up in the Soviet Union, he spent years building up his mind and body, eventually becoming both a pro athlete and a surgeon (at around fifty years old, I recall him looking more fit than some people my age). He held strongly to the ideals of humanism, altruism, and the Hippocratic oath. As a Muslim and non-Russian, he faced discrimination along the way, but ultimately made a promising career in Moscow. In 1994, when Chechnya attempted to break from the Russian Federation, the response was horrific. The Russian Army leveled almost every building in the capital, Grozny, and was virtually indiscriminate about the places it bombed and shelled. Perhaps 200,000 were killed in the course of the conflict, and many more psychologically and physically disabled. Dr. Baiev left the safety of distant Russian capital and went where he was needed; he was perhaps the only surgeon in the entire region. At great risk to his life, he adhered to his duty as a doctor and treated everyone and anyone he could, including Chechen militants and Russian soldiers. He explained how his Hippocratic oath, as a doctor, adhered him to helping whoever needed it, regardless of their allegiances. It was enough dealing with hundreds of patients in the middle of a war zone, but given the circumstances, Dr. Baiev was soon forced to make due with few resources. When his hospital in Grozny was destroyed by Russian shelling, he moved his operations to an abandoned clinic in his hometown of Alkan Kala, restoring it with the help of locals and his own funds. Anesthesia was handmade; running water, electricity, and gas were typically unavailable. Wounds had to be dressed with sour cream or egg yolks. Baiev relied on household tools for his procedures, including a power drill for brain surgery and a hacksaw for amputations; he did 67 amputations and eight brain procedures in the span of just three days. He and his nurses, some of whom were killed, even donated their own blood for patients. This went on for six years of almost constant warfare. Given the overwhelming demand for his services, Baiev would go days without sleeping, taking in an average of 40 to 50 patients. He never asked questions of those in need — he simply did his job and moved on to the next patient. He and the village elders kept the peace between the soldiers on both sides, who were sometimes in the same hospital, giving them equal medical treatment. But his willingness to help anyone put him on bad terms with both sides of the war, each of whom regarded him as a traitor. Bounties and arrests were put on his head. He was kidnapped several times and almost killed several more. He remained to do his job anyway, and only after an official warrant for his arrest did he reluctantly leave to America for the sake of his family. He has returned to Chechnya several times since the war, even organizing a group dedicated to providing affordable medical care and to raising awareness of the brutality of the conflict. He had all his procedures recorded as evidence of Russian atrocities, which the Russian government denied (allegedly going so far as to kill some of his patients as a cover up). I saw some of the horrific footage myself; I still can’t imagine how someone could take all that trauma daily for several years. Unfortunately, there is still much for him to do, as rates of birth defects, psychological trauma, and cancer remain high from the effects of the war. As I speak he still goes to his native republic to help despite occasional threats on his life. I subsequently purchased his book, The Oath: A Surgeon Under Fire, and had the honor of having him autograph it. When I saw him up close, I was struck by how large and strong he looked; the man was in damn good shape. Yet he had a really somber and weathered look to him, and I could feel that presence as well. He had a firm handshake and a force of personality, but at the same time maintained a quiet and humble demeanor, fitting for a man who risked certain death for simply doing his job without any want of attention or money. He is exactly the kind of man I hope to be, and exactly the sort of person who stays with you years later, inspiring you to be the best damn person you can be. Nations, not unlike individuals, have much to gain from being in good standing with their peers. A country with a positive image, compelling ideology, or attractive culture is likelier to enjoy more influence on the global stage, whether its visa-free travel for its citizens, trade deals, or international support for its goals. According to the most recent global polling data from Pew, the United States — technically the world’s sole superpower (or hyperpower) — has maintained is long-standing lead in the international popularity contest. Nevertheless, China in recent years has risen not only economically but in terms of global standing, even managing to unseat the U.S. in some traditionally pro-American places. Despite helping the world avert a nuclear holocaust over forty years ago, Stanislav Petrov is still little known even in his native Russia, let alone in the United States, which he saved from mistaken nuclear retaliation. In fact, he died this past May at age 77 in his home near Moscow with little fanfare or media attention; only through the efforts of an intrepid German activist, who sought to contact him this month to wish him a happy birthday, did this fact make it to major media outlets. Stanislav Petrov was the duty officer monitoring an early warning system from a bunker outside Moscow on Sept. 26, 1983, when the radar screen suddenly appeared to depict a missile inbound from the United States. The alert siren wailed. A message on the bunker’s main screen reported that four more missiles had been launched, he said. Petrov had 15 minutes to determine whether the threat was real and report to his commanders. Even on a good day in U.S.-Soviet relations, such an incident would have been believable. But to top it off, this was a period of increased tensions, as less than a month before, the Russians had shot down a Korean civilian airline that had accidentally drifted into Soviet airspace, killing all 269 passengers, including a U.S. congressman. Both sides had subsequently exchanged warnings and threats, so what Petrov and his troops saw on the radar was perfectly believable. Petrov sensed something wasn’t adding up. He had been trained to expect an all-out nuclear assault from the U.S., so it seemed strange that the satellite system was detecting only a few missiles being launched. And the system itself was fairly new. He didn’t completely trust it. After several nerve-jangling minutes, Petrov didn’t send the computer warning to his superiors. He checked to see if there had been a computer malfunction. Imagine being tasked with defending your country and having only a split second to make the call. Strategically, he would have been within his right to alert his superiors so they could retaliate accordingly, as per both Soviet and U.S. protocols. Instead, he relied on his cool reasoning and training to make the right call, despite the obvious risks. It was later revealed that the false positive was due to Russian satellites mistaking sunlight reflecting off of clouds for nuclear missiles; the simplicity of such an error makes one wonder how more such near-misses haven’t happened — provided they do not remained classified or went unreported. Indeed, the incident remained under wraps for fifteen years, until a Russian official mentioned the incident well after the fall of the USSR, and a German magazine picked up the story, making Petrov a minor celebrity. In all the time before the story emerged, Petrov’s heroism was officially neither rewarded nor even acknowledged; in fact, he was formally reprimanded for “failing to provide property paperwork”, which was no doubt due to his superior’s embarrassment of such a potentially catastrophic error. In 2013, Petrov was awarded the Dresden International Peace Prize, and 2014 saw the release of The Man Who Saved the World, a Danish documentary about the incident. Otherwise, Petrov remained little known until his belatedly-reported death attracted some attention from Western and Russian media — a seemingly surprising fate for a man who saved the world, but perhaps an indication of how much we take nuclear security for granted, given how many other potentially-disastrous incidents, errors, and accidents have occurred or been narrowly averted (and those are just the ones we know about). At first when people started telling me that these TV reports had started calling me a hero, I was surprised. I never thought of myself as one. After all, I was literally just doing my job. Something tells me he was more than happy to have simply saved the world and live into old age, with or without any credit or fanfare. It is a good thing there was someone like Petrov around that night, and hopefully there are more people like him in these delicate and potentially earth-shattering positions. One has to appreciate, with a degree of gallows humor, how amusing our rivalry with the Russians can be. The GBU-43/B Massive Ordnance Air Blast — a.k.a. the “Mother of All Bombs” — was developed in 2003 and remains the most powerful non nuclear bomb in the U.S. military; it has a blast radius of 1,000 feet and a yield of nearly 44 tons of TNT. Four years later, the Russians developed the Aviation Thermobaric Bomb of Increased Power, which is reportedly four times stronger than the MOAB (though this is disputed by some outside analysts) and of course they decide to name it the “Father of All Bombs”. Something similar happened during the Cold War, in which the Russians developed and tested what remains the most powerful human-made explosion in history: the RDS-220 hydrogen bomb, code name Ivan and known in the West as the Tsar Bomba. 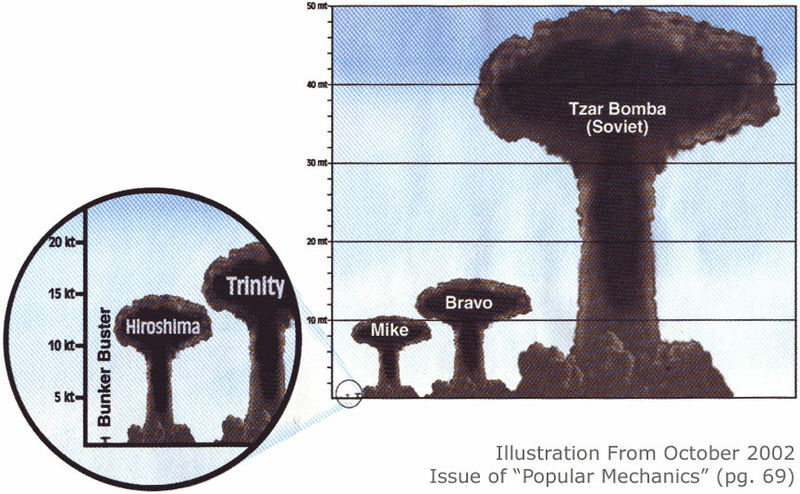 The three stage bomb had a yield of 50 megatons, which is equal to about 1,570 times the combined energy of the atomic bombs dropped on Japan, ten times the combined energy of all the conventional explosives used in World War II, and 10 percent of the combined yield of all nuclear tests to date. And to think that theoretically, it could have had almost double this power, were it not for its builders deciding to put a tamper to limit nuclear fallout. The kicker? The bomb was named “Kuzma’s mother” by its builders, which is a Russian idiom equivalent to “We’ll show you!”, and a possible reference to Nikita Khrushchev’s statement of same to the U.S. just one year before. Moreover, since it lacked any strategic application by virtue of its weight and size, some believe the whole point of the test was just to show up the U.S., which had earlier announced without warning that it was going to resume testing. As an almost life-long Russophile — despite not remotely having any roots or personal connections to the country or its people — I have always been fascinated by Russian culture, society, history, and politics. For better or worse, few nations have had so much presence and influence on the world stage, and while my love of all things Russia certainly does not include its government or foreign policy, I recognize the importance of better understanding this still relevant — some say resurgent — global power. Over at Foreign Affairs (one of my favorite international relations journals), Stephen Kotkin explores Russia’s long history of trying to achieve greatness, defined “by soaring ambitions that have exceeded the country’s capabilities”. It is equal parts tragedy and glory, with every victory coming at great cost (the defeat of Napoleon and Nazi Germany), and every instance of power and global status being tenuous (the perennial political and economic stagnation of the Soviet period throughout the Cold War). Despite my love for all things space and history, it almost eluded me that last Saturday, February 20, was the 30th anniversary of the launching of Mir, humanity’s first continuously inhabited space station, and until recently the longest-lasting. In its heyday — which remarkably persisted for far longer than originally intended — Mir was the epitome of human ingenuity, curiosity, and perseverance. As Vice’s Motherboard column recounts, the venerable Russian space station was the unlikely watershed for humanity’s exploration of the stars. This station outlived the Soviet regime that conceived and bore it, and died in the shadow of its successor and beneficiary, the International Space Station. It was home to 104 astronauts during its 15 year lifespan, and completed its projected mission duration three times over. It was a pivotal stepping stone in human spaceflight, a technological and geopolitical bridge between millennia, and an enduring symbol of peace on Earth and off it. Like some of the most beloved fictional spaceships—the Millennium Falcon, Battlestar Galactica, or Serenity, for instance—Mir was simultaneously regarded as a resilient survivor and a derelict piece of junk. Some skeptics were even less forgiving in their judgment of Mir’s repeated flirtations with catastrophe, calling the station a “lemon”, a “time bomb”, and even a “death trap”. Among the numerous incidents mentioned in the article (and well worth reading for yourself) were three collisions, one of which led to the permanent, functional loss of an entire block; a massive fire hot enough to burn through metal, which persisted for fifteen minutes and blanketing the station in smoky debris; and basketball-sized globs of dirty water laden with microbes, which were floating freely around the station. All this plus a host of other smaller threats, such as computer glitches, power outages, coolant leaks, corrosive mold, and still more. Needless to say, Mir would hardly have seemed to be such a promising benchmark for human progress in space. Yet the station’s ability to endure all these never-before-faced challenges — due in no small part to the resourcefulness, courage, and tenacity of its cosmonauts — is precisely what makes it such an incredible step for our species. Indeed, the scruffy nature of Mir has become one of its most defining—and endearing—qualities in retrospect. It is legitimately astonishing that nobody was killed or seriously injured on this accident-prone ragamuffin of a station, when you consider the all the wild cards that were in play. If astronauts had died, of course, we would construct a very different legacy around its tenure in space, tempered by that grim reality. But because Mir managed to lackadaisically extricate itself out of every scrape it got into like some spacefaring Bugs Bunny, it’s now remembered as a plucky trailblazer that always beat the odds rather than the “death trap” some considered it to be at the time. We love lucky heroes, and Mir hit that archetype out of the park. To add to that, Mir was a phenomenal success for the global spaceflight community despite all of its problems. Thousands of experiments were conducted during its stint in orbit, revealing valuable insights about the biomedical, technological, and political challenges of operating a long-term base in space. Unsurprisingly, Mir would prove to be the ultimate testing ground for generations of spacefarers, subsequently producing some of the most experienced and accomplished cosmonauts in the world. Valeri Vladimirovich Polyakov still maintains the record for the longest single spaceflight, having spent 437 consecutive days and 18 hours at the station from 1994 to 1995. While Polyakov did report mood fluctuations when he arrived at Mir and when he returned to Earth, he has not suffered any long term health effects as a consequence of his time in space. Mir cosmonauts also hold down the second, third, fourth, fifth, and sixth places on the single spaceflight leaderboard (fun fact: Polyakov comes in at both first and sixth place). To put that into perspective, the ISS One Year Crew, comprised of American astronaut Scott Kelly and Russian cosmonaut Mikhail Korniyenko, is expected to arrive home next month after 342 days in orbit. But that achievement will only nudge them into fourth place behind the insane spaceflight records left by Mir cosmonauts. Given all this, it is little wonder that Mir laid the technological groundwork for its spiritual successor, the International Space Station, for which the Russians have continued to play a leading role, from its construction to the supply of materials and staff. But in addition to its technical legacy, Mir pioneered the idealism that has always, to some degree, imbued space exploration. It was the crucible in which international collaboration could be achieved, even in the midst of the Cold War. This intent on behalf of the Soviets—then later, the Russians—to use the space station as a symbol of humanity’s noblest qualities was embedded right into the mission’s name. The Russian space program has always had a particular knack for coming up with concise yet semantically potent names for its programs from Sputnik, meaning “fellow traveler”, to Soyuz, meaning “union”. This was more than just propaganda: Mir would come to live up to its namesake by hosting several joint missions with the United States and various other nations. Thus the plucky, ramshackle marvel of human ingenuity (if not stubbornness) would prove that the divided nations of the world — for practical reasons as much as idealistic ones — can and would come together to achieve great things in space. As Mir’s thirtieth birthday passes, here is hoping that its legacy can continue to spur the human race into pooling its resources, technology, and know-how into the next great endeavor of our species’ history. Given recent geopolitical events, it seems like an unlikely prospect; but if it could pulled off during the tense decades of the Cold War, whose to say we cannot transcend current Earthly squabbles once more? The Soviet regime might have been repressive and stultifying in a lot of areas, but one place where it exercised a considerable amount of boldness and innovation is public infrastructure — including the humble bus stop. The photos were taken by Canadian photographer Christopher Herwig, who has spent over a decade travelling through most of the former Soviet Union to document these neglected architectural marvels. You can see a larger version of each photo by clicking here. The Soviet Union ascribed an outsized importance to public transportation. Buses, trains, and metro lines were a sign of progress; they were also a powerful symbol of connection and unity, as the Politburo worked to build a communist society throughout 15 ethnically diverse republics that covered a landmass stretching from the Baltic Sea to the shores of the Pacific. Perhaps the most famous legacy of this Soviet fixation on transport is the Moscow Metro system, with its glittering chandeliers and its elaborate murals depicting scenes of proletariat glory. But Moscow was dressed up in order to be shown off — to serve as a demonstration of socialist power and might for visiting foreign dignitaries. Most citizens lived outside the capital, and for them, buses were the predominant means of transportation, accounting for nearly 44 percent of traffic throughout the country by the mid-1980s. What makes the extravagant, eye-catching nature of the common Soviet roadside bus stop all the more surprising is that these were often tucked away in hidden corners of the empire, far from the eyes of foreigners. Soviet architecture is best known for its overpowering conformity and functionality: The term conjures up images of rows of low-slung buildings and mass-produced apartment blocks. These bus stops, however, were an unlikely outlet for creative expression. Local artists were given unprecedented freedom to experiment with design, color, and material. Many of the designs were commissioned at the local level, which allowed for artists and architects to reflect the character and history of their individual republics. What came about was thousands of unique creations, covering a range of shapes and sizes. Artists still worked within the confines of Soviet art, employing communist imagery of peasants in wheat fields and relying on austere, minimalist structures. But the more flamboyant bus stops reimagined this aesthetic, twisting standard outlines and incorporating local elements into their design. For instance, a bus stop modeled after the Silk Road-era Arystan Bab mausoleum in Aralsk, Kazakhstan sports a minaret and crescent moon, while one in the Black Sea coastal town of Gagra takes the shape of a breaking wave, decorated with purple mosaic tiles. These are just some of the amazing examples from Herwig’s collection. 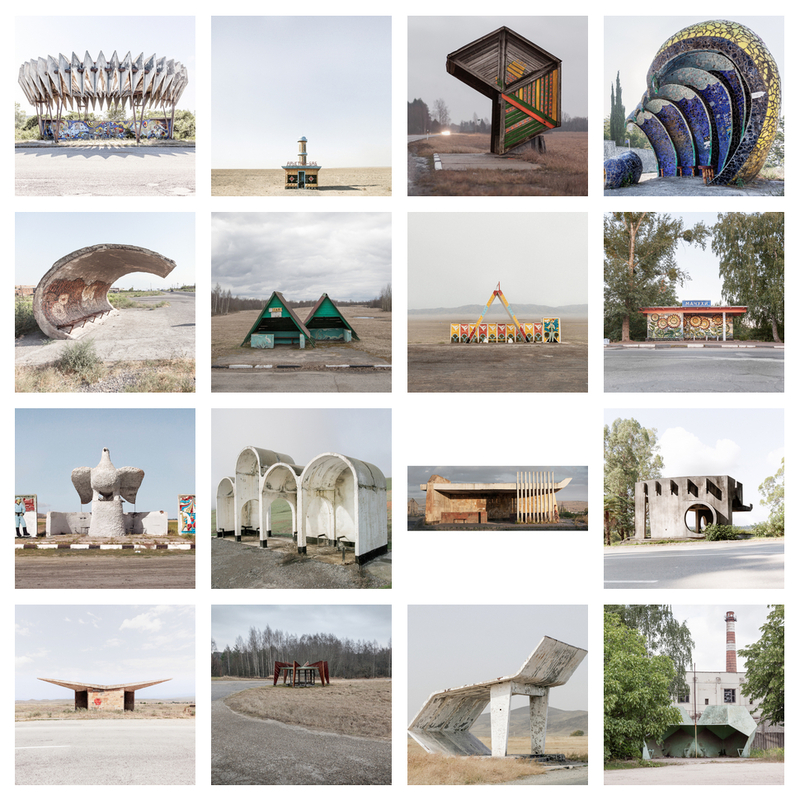 You can find more in his newly published “Soviet Bus Stops“.